We've been studying Great Britain for the last few weeks. Originally I had only planned 2 weeks, but somehow we've managed to turn it into a 4 week study so far...and really we've only touched on the England part of Great Britain. Because there is a LOT one can study in Great Britain. I was more confused with the whole Great Britain/UK thing to start with. Because silly me thought they were one and the same (in case you were wondering, they aren't). 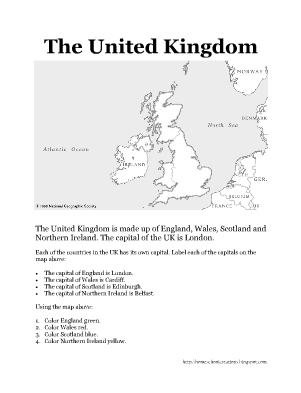 Used our atlas and map to find England and tried to figure out the difference between England, Great Britain, and the UK. Got frustrated and decided to talk about it the next day. Pulled out the altas again now that we've figured out that Great Britain is England, Wales, and Scotland. The UK includes Great Britain and Northern Ireland. Talked about the capitals of the 4 different countries and also that London is the capital of the UK. Read Bard of Avon: The Story of William Shakespeare by Diane Stanley and also Charles Dickens: The Man Who Had Great Expectations by Diane Stanley. Guide to British life and culture - put together by the Woodlands Junior School, UK. One of the best and most informative sites I found for our studies. You can find almost anything here. British Monarchy Official Site - Anything and everything relating to the British monarchy - even has links to the Royal YouTube channel. Visit Britain - explore parts of Britain using an interactive map. Also has links to all the official websites. I am pleased you found our website (Woodlands Junior) useful. I would be happy to help you with any questions you could not find the answer to. You mentioned in your post about a geography song for the British Isles. I have not heard of one. Would you be able to send me the words? This is the site where we are adding quick facts and information.